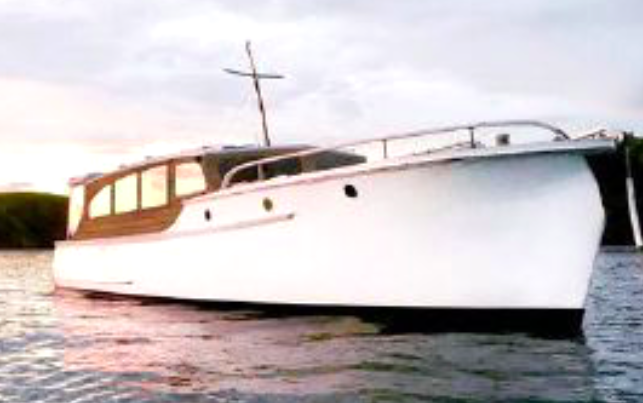 This entry was posted in 1950's, 36'>38', A Peek Down Below, Boat Sheds, Designers & Builders, How To, Launches, Non Waitemata and tagged Lady Ellen by Alan Houghton - waitematawoodys.com founder. Bookmark the permalink. New cabin coamings are finished in Iroko and will be varnished inside and out. Dashboard, glovebox fascia, chart drawer/whiskey cabinet, helm and nav leaners, table top and misc interior trim are also varnished Iroko. The image in the 2018 CYA register shows what she will look like on the outside when finished.